Playing these assorted concertos and sinfonie one-to-a-part (plenty of 18th-century precedent here), Alessandrini and his crack players marry elegance with unfailing rhythmic zest, always attentive to textural clarity and the shaping of bass lines. The continuo (harpsichord and/ or theorbo) adds impetus without ever becoming irritatingly obtrusive. Alessandrini and his band bring a devilmay-care exuberance to a Vivaldi ripieno concerto – one of the few works here with no Corellian pedigree – and a vividly gestural, quasi-operatic manner to a sinfonia funebre which may or may not be by Locatelli (though the final minuet is arguably too breezy for music marked ‘La consolazione’). The players are invariably sensitive to harmonic flux, not least in a darkly brooding sinfonia by Gaetano Pugnani that sounds like Corelli updated for the Classical age. A word, too, for violinist Boris Begelman’s mingled brilliance and grace in the Durante concerto. 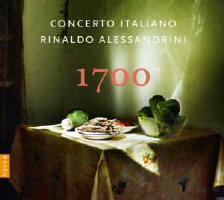 In an enterprisingly chosen repertoire, Concerto Italiano are here at their exhilarating, imaginative best.